Click here to see our extensive online catalogue. We add new products almost weekly in order to stay current with the latest trends & technologies to help put your business ahead of the competition. For over 20 years, Slimline Warehouse has been a leading provider of POP, POS, retail, & exhibition displays for Australians. Same day despatch is provided on the majority of our in stock products with purchases made prior to 1pm EST to anywhere in Australia, including Brisbane, Toowoomba, Sydney, Melbourne, Alice Springs, Perth, Adelaide, & Darwin! Sign frame able to display 216 x 281mm dual-sided graphic to easily be seen! The stanchion merchandising bowl makes it easy to place impulse items to purchase in a queue. The polycarbonate bowl is durable to withstand use in public areas without worry for years to come! These crowd control posts also have a sign frame that goes on top of the bowl to show sale price or announce promotions. This dual-sided sign holder helps reach out to customers on all sides, and is meant to hold a 216 x 281mm graphic! The bowl attaches to the top of a barrier post without any tools easily. The stanchion merchandising bowl, like retractable belt displays, are used in locations such as exhibition halls, retail stores, shopping centres, car dealerships, and trade shows. The retractable belt extends out up to 1.8m to easily attach to another crowd control post, with the post top featuring (3) connectors to attach other belts. The end of the belt features a tamper proof clip to stay on during use as well. 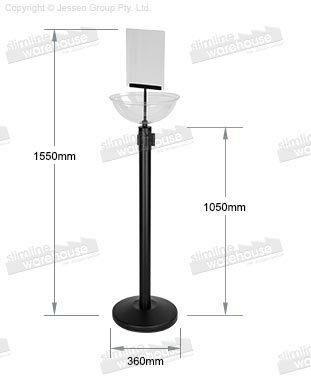 The queue pole itself is made from steel, with a weighted base that stabilises the stand. A non-slip rubber sole also helps to prevent scratches to the floor!